Well whether you are going to a party or out "Trick or Treating" Halloween has always been an excuse to dress up and scare people. Anyone can buy or hire an outfit from a store. Its loads better though, and certainly lots more fun, to make your own. For parents too turning your little angels into fiendish demons is a great way to spend a bit of quality time with your kids. 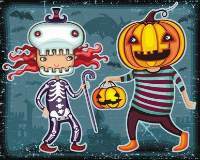 Its activities like making scary Halloween costumes together that can actually make holiday traditions like Halloween that little bit extra special. Just to show Halloween can be for the very youngest member of the family. For this you need a red babygow. Make a tail from a strip or roll of red material with a devils fork at the end. In a similar way make 2 small red horns and attach either on a hair band or on the top of a red bonnet. Girls wear a black leotard and tights or leggings. Boys a black long sleeved shirt and trousers. Make four extra legs by stuffing black tights or long black socks with material. Attach these to your belt. if you include some old flex or wire in your legs you can make them into more realistic leg shapes. Wear black gloves. A black balaclava type hat on your head works well alternatively you could use black face paint. Swimming goggles actually make quite good spider eyes. For antenna buy cheap "deely boppers" and customise with black plastic tape. This is one of the easiest costumes to do. Buy some old white sheets from a thrift store / secondhand shop. Make them nice and grubby then cut or rip into long bandages. Carefully wrap every part of you body. Decorater's masking tape is a great way to hold your bandages in place. A ghostly white painted face with reddish grey eye sockets peering though the bandages adds to the scary effect. Important - Even Mummies have to visit the bathroom. Make sure you allow a failsafe way to enable you to go! If you wear trousers and a t.shirt under your bandages and split your wrapping to the 2 parts of your body it should be possible to tie the lower and leg bandages to your belt loops in order be able to still pull your trousers down. Its not easy being scary! First you need a black outfit. Either tight trousers, leggings or tights and a long sleeve black shirt. For the bones you could use fabric paint. Alternatively you could cut bone shapes from an old white sheet or card and roughly stitch or stick them in place. For the skull make a white skull mask from cardboard. Alternatively use a white swimming hat and white face paint. Wear a black dinner suit with a white wing collared shirt. The count usually wears some kind of medal at his neck rather than a tie. Slick back your hair with gel. Use either plenty of make-up or very lightly applied white face paint to give yourself a deathly pale "just come from the crypt" sort of look. Eye liner and other make-up can be used to enhance your Vampiric features. Fangs (plastic) are best brought from a joke or costume shop. If you can find a black cloak with a fastening chain at the top your look is complete. There is nothing to stop ladies dressing up as the Count. They could also however look stunning as the Bride of Dracula. Wear a slinky long dress and gloves with a long jet black wig, pale makeup, red lipstick and fangs. The trouble is of course that if you do really look like a vampire in theory you can't admire yourself in the mirror! Nothing too difficult here. Black clothes and a pointy witches hat. You can make it loads better however by using blotchy green face paint (applied with a sponge for best effect). Then with a thin brush add dark patches around the eyes, lines, warts and wrinkles. This is very effective and a bit different. Buy a cheap rubber swim hat orange if possible if not white or yellow. Use orange/ yellow face paint on yourself and the hat if need be to give a good pumpkin colour. Add lines to mark the ridges on the pumpkin and a stalky bit on top. Use a thin brush and black paint to design a scary Jack-O-Lantern mouth and eyes. This is variation on the idea above and involves making a papier mache pumpkin head. You need a large balloon. Inflate and then add several layers of papier mache paper soaked in wallpaper paste. It is best to add a few layers a day for 3 days. Allow to dry. Put a pin in to pop the balloon. Carefully cut the bottom of your head off. Paint orange / yellow and add a scary Jack-O-Lantern face cutting out eyeholes as necessary. Again use the peasant, scarecrow look for the rest of your outfit. This is a novel fancy dress but you need to get working on it a few days before your Halloween Happening. In advance make a papier mache head by applying paper soaked in wallpaper paste to a head sized balloon. When dry paint your head to resemble… well… a head! Make it ghoulish. You may like to add an old wig or other fake hair. A bloodied rag around the neck gives that nice "freshly severed" look! The rest of the outfit is easy, simply an old sheet with an elasticated neck or baggy white shirt that you can put on and then pull up over the top of you head. Pad your shoulders so that your own head is not too obvious below the sheet / shirt. You may like to cut some holes in your outfit so you can see. Carry your head under your arm. This can look really effective if you don't mind wearing it. Basically you use bacon rashers and slices of salami pressed against your face held in place with clingfilm. Start at the bottom and work your way up. Top tip - Do make sure you can breathe! You can either cover your entire head or just your face and then use a wig or hat. A string of sausages nonchalantly looped around your neck will turn you into a carnivores delight. Rather than particular characters some people prefer just to go for variations on the scary monster / zombie. Black eye - Use a cotton ball to apply diluted red face paint over and around your eyelid and socket. Then add diluted blue face paint. Bullet hole - Use eyelash glue to stick a cornflake on your face. Paint it to match whatever colour your skin is to be. Use cotton wool to apply diluted red face paint around the wound. Squeeze a small blob of foundation to the wound then add a dab more red paint so it looks like blood seeping from the wound.